brooke and i way back when. in our HOT gap overalls. i posted this pic once here (back in 2006 - man we have been blogging awhile!) so i hope it still counts for wbw. i will scan some new oldies but goodies SOON i swear. why did i think it was fun to climb on people. who does that? and that must be your owl in the background. it's okay to climb on people when you're tiny. i can't speak for brooke, but as a rather tall girl myself, i just come to kind of expect it. One of my all time favorite pics. I love it. 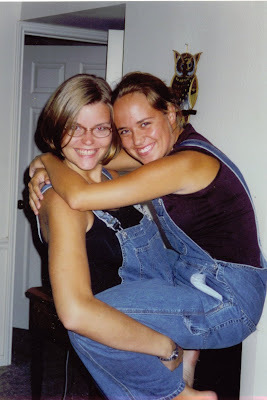 Oh I loved and miss my Gap overalls. I think I actually still have them packed away somewhere hoping they come back in style!!! We love WBW! That is one awesome tan! note hootie in the background.